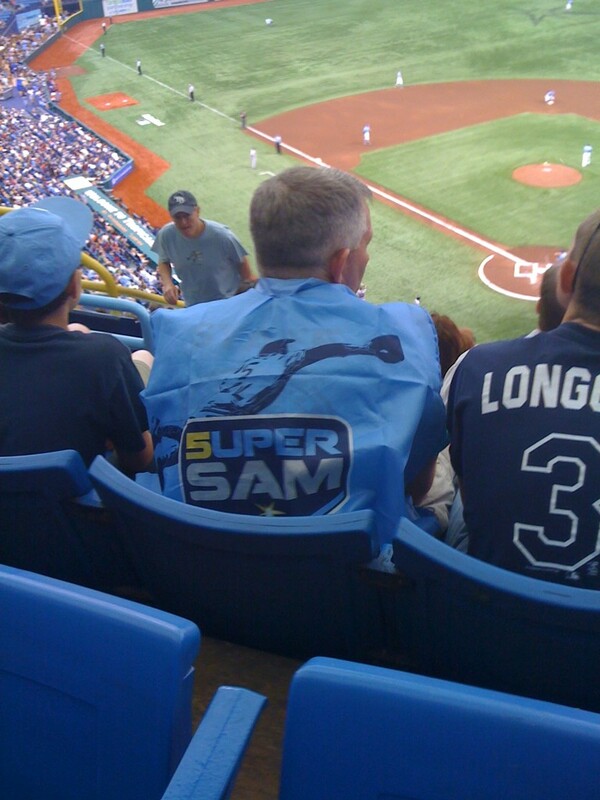 Yesterday was Super Sam Fuld Cape Day in Tampa, as the Rays gave away superhero capes to all kids in attendance (and apparently to at least one adult). 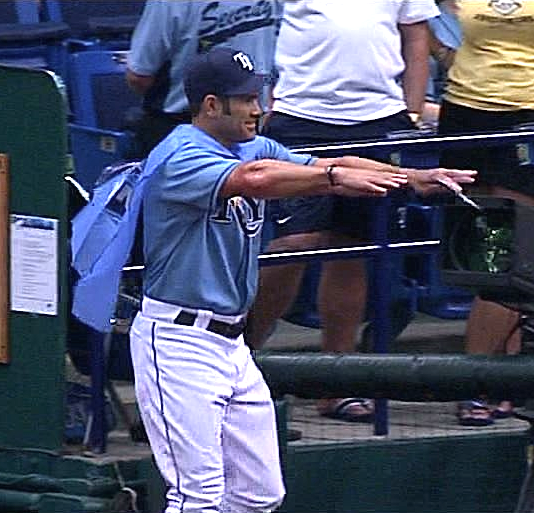 As you can see in the photo above, Fuld himself donned one of the capes as the Rays celebrated their 7-0 win over the Indians. Earlier, Johnny Damon had worn one while bringing out the lineup card (plus he’d also worn one during pregame warm-ups on Friday). 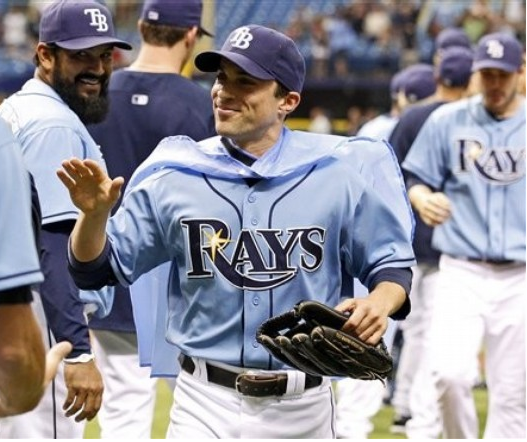 Between the Braysers and now the capes, the Rays win the prize for wackiest MLB accessories. Speaking of which, Damon was one of several Rays wearing the striped hose yesterday. As you may recall, those socks debuted last year, but I didn’t realize they were still being worn this season. Has this been going on all season long, or was it a special thing for yesterday? 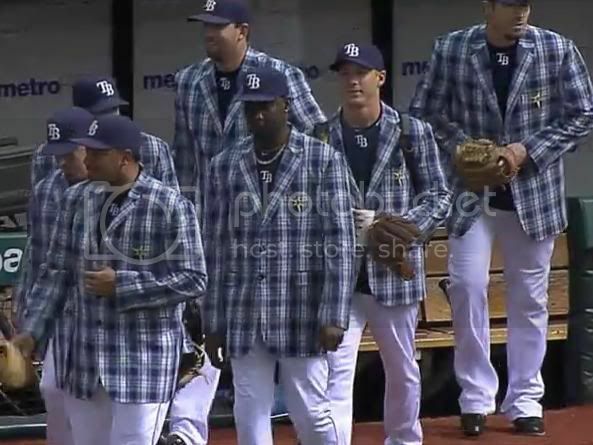 As someone who wore a cape to work one time, just to see the reaction, I approve of the Rays wearing them in pre-game. The first link doesn’t work. Works fine for me. But I’ve adjusted it, just in case — try now. Couldn’t agree more with your two cooking tips. Anything but charcoal would be un-American and more than medium-rare is a waste of good meat. Happy Memorial Day everyone, and many thanks to service members both past and present. I don’t imagine that, as a Cowboys fan, Hank’s had a good year, anyway. That was the first time this season the Rays had broken out the good hosiery. It’s a shame that they’ve worn them so little; they look so much more like ballplayers with them. Sorry if this is one of those “duh, don’t you read the comments every day” things, but it would be news to me. The Tribe were wearing their standard road greys in that game. Thanks — right. I finally had time to do my 30 seconds of photo research. Sure looked like it from that shot, though. 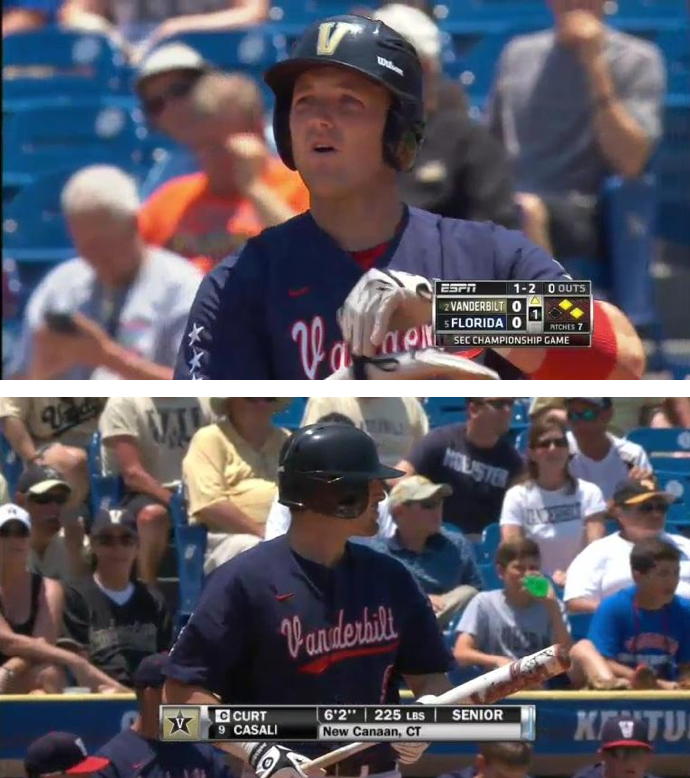 Anybody know why Vanderbilt was wearing orange and navy in the SEC Baseball Championship game yesterday, which was almost the same color as their Gator opponent? I believe it was supposed to be red-white-blue, for the holiday. I was thinking that too, but it looked more orange than red. Didn’t someone here say they wear them regularly as some sort of miliary tribute or something? And that even though it does look orange on TV it actually is red? Capes: Cool promotion, but can’t compare to the glory of Halter Top Day in the 70s. Yes. They need to reprise that promotion. Yet more evidence in favor of my theory that the 70s were the peak of human civilization. Everything was awesomer then, and it’s been downhill ever since. Is it just me, or do major college athletics seem to be approaching some kind of tipping point? Not that the shenanignans at The Ohio State are monstrous, but everything going on everywhere has an overall sense of something starting to stagger under the weight of its own self-indulgence…and the includes the current need to have three sets of helmets, special game “costumes”, ridulously gaudy receiver gloves, duplicate numbers to stroke the egos of 17-year-old “legends” and recruiting so many kids with absolutely no intention of getttng an education. Then again, maybe not, no one ever in the NCAA seems to say that anymore. But I hate to imagine what it will be like in a few more years if someone doesn’t. I’d like to think that if enough Scheiss hits the fan in big-time collegiate athletics, even the suits in Indianapolis would take some serious action. But since competition at that level is basically about money, I have my doubts. Warren, I couldn’t agree with you more. Unless the NCAA launches major reform with the huge financial commitment involved in enforcement, nothing will change. The money is just too great, this is driving the desire to win at all costs. Paying the players a small stipend won’t solve the problem, either. I sensed a tipping point myself several years ago, when the media started referring to D1 college football teams as franchises instead of schools. But when you stop and think about it, the major teams in D1 do share many similarities to professional sports franchises. From Ohio State’s perspective, it’s also disappointing to see a second outstanding head coach leave under these circumstances. Did you all see South Park this past week? They set their sights on the NCAA. Destroyed it. Happy Memorial Day to all the readers and thanks to Paul and his cohorts for the continued great work. God Bless all the troops and those that have served, past, present, and future. Some of the best advice you could give to anyone, ever. I just grilled some corn for my corn salad. I have both setups, but time can be of the essence. Give me convenience or give me death. Finally Marty, we’ve found common ground. Very nice, Ben. So we both love the Dead Kennedy’s. Kennedy’s, Milkmen, whatever. Let’s not let it happen too often. I am Wrigley for the Astros/Cubs game. The Baseball Project is sitting infront of me! Astros and Cubs are both wearing the red&white caps. Astros in road grays and the Cubs are in home pin stripes. Watching Band of Brothers today, I almost forgot that the airborn infantry wore football helmets when paratrooping. – When were plastic football helmets first used and by which team/s? – Is it possible that those plastic helmets used by US airborne troops were in fact designed for them and only later used by West Point and other football teams? They only wore those very early in the airborne test platoon period. Only during training. – Hats were a big topic of conversation in the clubhouse this morning. For Memorial Day, the Yankees – and all of Major League Baseball – are wearing one-day-only caps. The Yankees are mostly blue, with white in the front and a red, white and blue logo. Great reason to wear the hats, but they’re not necessarily a good look. One everyday player loved them. Another seemed to be leading the charge against them, disappointed in everything from the look to the fit. 2) Just saw the Giants with a red cap. Wrong, wrong, wrong. 3)Hot dog of choice today: Hebrew National. If only his first name was Elmer, huh. In fact, if his nickname ISN’T Elmer, MLBers have lost their sense of humor entirely. In other news, the Pope is Catholic. Those ASTROS TWEAKS are AMAZING! It would be a dream come true if they changed to them next year. Thank you Timothy McKay! I like the current set less & less…especially since I saw your tweaks for the first time a week or so ago. I found this ’47 brand hat last year that combines the current logo w/ those old colors & started thinking about a color change…but it seems like the H-star logo is the most popular w/ people in Houston. That set of tweaks is the perfect combo! Been showing those to friends who are huge ‘stros fans & they LOVE your concepts! Please, please submit those somehow when the sale of the team becomes final. I know the chances are slim, but crazier things have happened. Too liberal and anti-war to call it Memorial Day? I was more insulted by the refusal to call it Memorial Day than the terrible Rays uniforms gracing the front page. Regardless of what you think of the people who become more patriotic for today and decorate for it. I think that’s great, today is a good day to be patriotic and remember those we have lost fighting for our country. Anytime the sport that placates to the hispanic culture more than celebrating American unity, actually has a day where patriotic symbols are seen all over, that is a good thing. I find it ironic making the whiny and illegal immigration and non-assimilating hispanic players and coaches having to wear something with American symbolism. I find it hilarious if Ozzie Guillen actually wore one. Go ahead and blast away with the racism accusations rather than thinking about it. Hope everyone had a happy MEMORIAL Day, to remember our heros. Memorial Day used to be called Decoration Day (look it up). I like to use the original name, as a nod to history. I didn’t realize it would also enrage certain assholes, but that’s a nice bonus. It was Decoration Day a long time before it was Memorial Day. Decoration Day was established and named by veterans of the Civil War, and intended to memorialize the Union dead. It became Memorial Day because people such as yourself tend not to know such things. Where did you serve, by the way, John? In what branch? Must have been an unusual unit if it didn’t contain a higher percentage of Hispanic servicemen than the percentage of young adult Hispanics in the general population. Same is true for Medal of Honor winners, too. As I’m sure you know. Of course you were talking about 1) “Whiny and illegal immigration”; and 2) “Non-assimilating hispanic players and coaches.” Two different phenomena, right? Those non-assimilating guys are legal, of course, visas and all. And why should they assimilate if they’re not trying to immigrate? Nothing wrong with a Dominican or a Venezuelan wanting to stay Dominican or Venezuelan. Or is there? And of the illegal immigrants (people who want to stay in the US), I can’t name one who’s a professional ballplayer. Maybe you can tell me. John, I would not ever call you a racist. On the evidence, though, you do seem ignorant. Give a try to that “thinking about it” recommendation you offer. Oh, and Ozzie Guillen became an American citizen a few years ago, enraging more than a few of his native Venezuelan fans. Wow! John just got f’ing owned by Paul, Connie, and Tim. That made my day.